Garlic is one of those crops that is ready to harvest all at once. 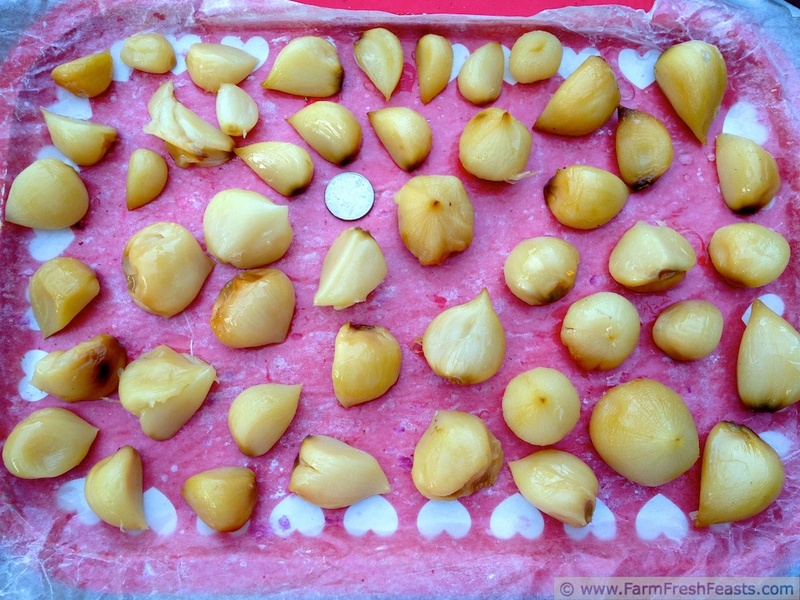 While it is easy to store for long periods, if you're harvesting your year's supply of garlic in June, you may want to have some put by when you go to grab a clove in November and find nothing but shriveled, dry husks. 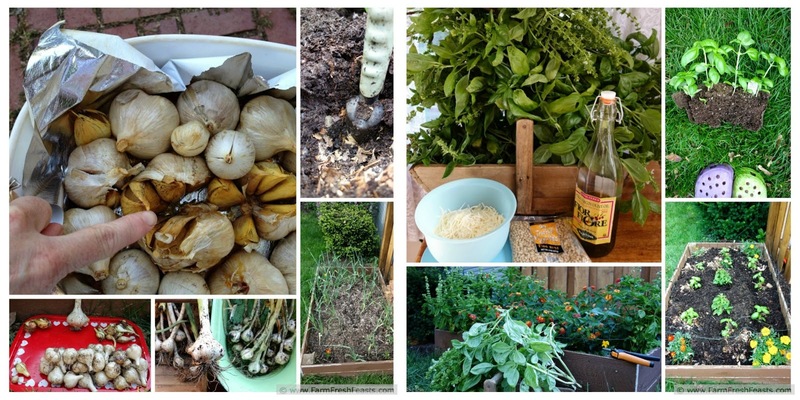 In my garden, I use one raised bed for my garlic and pesto harvests. In the fall, I plant garlic (around the time you'd plant tulips). After harvest in early summer, I plant basil in the same space. I'll use the basil throughout the summer, then pull the plants and put up a pile of pesto (link to my tutorial) for winter. For a full explanation plus more photos, please see my guest post over at She Eats. I like to roast my garlic. After harvesting I let the garlic sit on a tray on my porch for a few days so that it can dry out a bit. Makes it easy to brush the soil off. Then I trim off the main stem and it looks like what you think of when you think of a head of garlic. I nestle the heads in a casserole dish (high sided oven safe pan) on some foil or parchment paper for easy clean up. Then I drizzle olive oil over top and put them in the oven. I roast them at 400 degrees F for 20-45 minutes until I can squeeze the bulb and it feels soft. Once it's cool, I remove the garlic skins and lay the cloves on a parchment-lined tray to quick freeze. 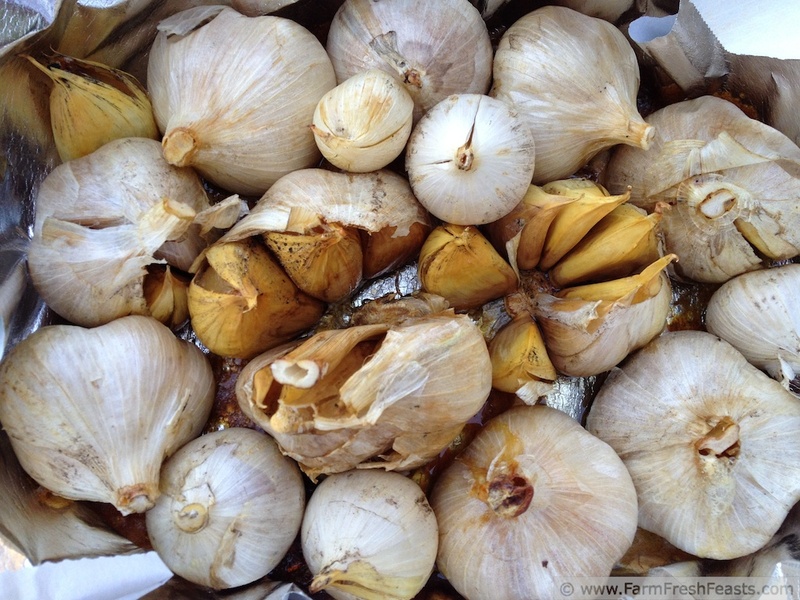 Unfortunately, I forgot to save out the cloves for planting before I roasted the harvest, so I won't be having gigantic garlic next year. Live and learn. The coin is a quarter. Those cloves are BIG! After they are frozen I transfer them to zip top bags and store them in the freezer. I add a bit of roasted garlic to spaghetti sauce, meatloaf, soup, pizza dough, really anything that needs a hit of garlic. Check out my Visual Recipe Index by Ingredient above--there's a category for recipes I've done using garlic. No need to thaw or mince, the clove just melts into the dish. I've got a Pinterest board for garlic scapes recipes from around the web. You can find it here. For suggestions on How to Use this Blog, click here. Garlic that just melts...mmmmmm. Am I too late to plant a clove? 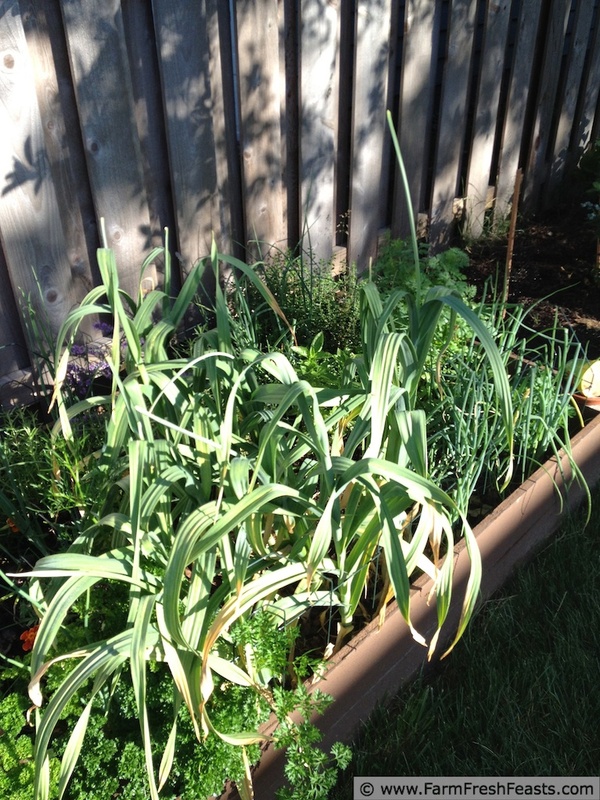 I am a 'plant before Thanksgiving' garlic grower, but what the heck--plant some anyway! If you've got any cloves leftover from your CSA you may as well give it a shot. I do, so when the snow melts I'll throw a couple of cloves in and get back to you. Thanks for finding this--my 3rd post! Great idea! I grow tons every year and this will help!! It really helps me (since I don't have lots of cold storage space), so I'm glad for the opportunity to help out others in the same situation. I keep mine in a paper bag in a cool place (I figure the bag keeps them dark). They dry out a bit, but it doesn't seem to affect their sprouting after planting. I'm glad you remembered to hold some out for next year--you're doing better than I was!